Magritte died August 15, 1967 in Schaerbeek, Brussels, Belgium, of pancreatic cancer. He was buried in Schaarbeek Cemetery. René François Ghislain Magritte (pronounced mag·reet) was born November 21, 1898, in Lessines, Hainaut, Belgium. He was the eldest of three sons born to Léopold (1870-1928) and Régina (née Bertinchamps; 1871-1912) Magritte. Aside from a few facts, almost nothing is known of Magritte's childhood. 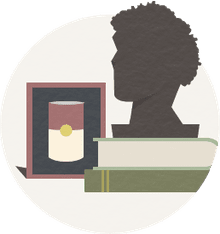 We know that the family's financial status was comfortable because of Léopold, ostensibly a tailor, made handsome profits from his investments in edible oils and bouillon cubes. We also know that young René sketched and painted early on, and began taking formal lessons in drawing in 1910 — the same year that he produced his first oil painting. Anecdotally, he was said to be a lackluster student in school. The artist himself had little to say about his childhood beyond a few vivid memories that shaped his way of seeing. Perhaps this relative silence about his early life was born when his mother committed suicide in 1912. Régina had been suffering from depression for an undocumented number of years and was so badly affected that she was usually kept in a locked room. On the night she escaped, she immediately went to the nearest bridge and threw herself into the River Sambre that flowed behind the Magrittes' property. Régina was missing for days before her body was discovered a mile or so downriver. Legend has it that Régina's nightgown had wrapped itself around her head by the time her corpse was recovered, and an acquaintance of René's later started the story that he was present when his mother was pulled from the river. He was certainly not there. The only public comment he ever made on the subject was that he'd felt guiltily happy to be the focal point of sensation and sympathy, both at school and in his neighborhood. However, veils, curtains, faceless people, and headless faces and torsos did become recurring themes in his paintings. In 1916, Magritte enrolled in the Academie des Beaux-Arts in Brussels seeking inspiration and a safe distance from the WWI German invasion. He found none of the former but one of his classmates at the Academie introduced him to cubism, futurism, and purism, three movements he found exciting and which significantly changed the style of his work. Magritte emerged from the Academie qualified to do commercial art. After a compulsory year of service in the military in 1921, Magritte returned home and found work as a draughtsman in a wallpaper factory, and worked freelance in advertising to pay the bills while he continued to paint. During this time he saw a painting by the Italian surrealist Giorgio de Chirico, called "The Song of Love," which greatly influenced his own art. Magritte created his first surreal painting, "Le Jockey Perdu" (The Lost Jockey) in 1926, and had his first solo show in 1927 in Brussels at the Galerie de Centaure. The show was reviewed critically, however, and Magritte, depressed, moved to Paris, where he befriended Andre Breton and joined the surrealists there — Salvador Dalí, Joan Miro, and Max Ernst. He produced a number of important works during this time, such as "The Lovers," "The False Mirror", and the "Treachery of Images." After three years, he returned to Brussels and to his work in advertising, forming a company with his brother, Paul. This gave him money to live on while continuing to paint. His painting went through different styles during the last years of World War II as a reaction to the pessimism of his earlier work. He adopted a style similar to the Fauves for a short time during 1947-1948, and also supported himself doing copies of paintings by Pablo Picasso, Georges Braque, and de Chirico. 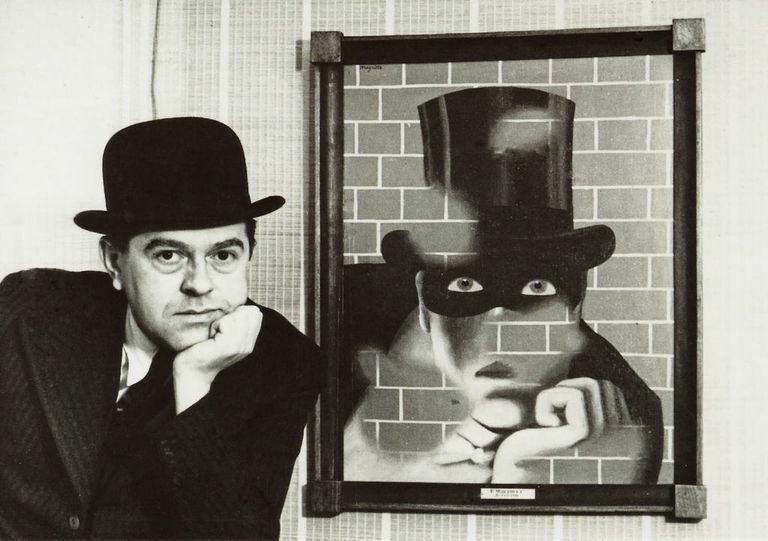 Magritte dabbled in communism, and whether the forgeries were for purely financial reasons or intended to "disrupt Western bourgeois capitalist 'habits of thought'" is debatable. His arrangements were often impossible under the laws of physics. The scale of these mundane elements was frequently (and deliberately) "wrong." When words were painted — as they were periodically — they were usually a witticism of some sort, as in the aforementioned painting, "The Treachery of Images" on which he painted, "Ceci n'est pas une pipe." ("This is not a pipe.") Although the viewer can clearly see that the painting is, indeed, of a pipe, Magritte's point is just that — that it is only a picture of a pipe. You can't pack it with tobacco, light it, and smoke it. The joke is on the viewer, and Magritte points out the misunderstandings that are inherent in language. Ordinary objects were painted in unusual ways and in unorthodox juxtapositions in order to evoke mystery. He is known for painting men in bowler hats, perhaps autobiographical, but perhaps merely a prop for his visual games. My painting is visible images which conceal nothing; they evoke mystery and, indeed, when one sees one of my pictures, one asks oneself this simple question, 'What does that mean?' It does not mean anything because mystery means nothing, it is unknowable. More of René Magritte's work can be seen in the Special Exhibition Gallery "René Magritte: The Pleasure Principle." Magritte's art had a significant impact on the Pop and Conceptual art movements that followed and on the way, we have come to view, understand, and accept surrealist art today. In particular, his repeated use of commonplace objects, the commercial style of his work, and the importance of the concept of technique inspired Andy Warhol and others. His work has infiltrated our culture to such an extent that it has almost become invisible, with artists and others continuing to borrow Magritte's iconic images for labels and advertising, something that would no doubt greatly please Magritte. Calvocoressi, Richard. Magritte.London: Phaidon, 1984. Gablik, Suzi. Magritte.New York: Thames & Hudson, 2000. Paquet, Marcel. Rene Magritte, 1898-1967: Thought Rendered Visible.New York: Taschen America LLC, 2000.